These "shopping bags" are built to the same specs as our packs and travel luggage - from beefy 1000 denier coated Cordura Plus. Shoulder / carry handles cradle your load and make "saving a tree" easy - as long as you remember to tote your URBAN HAULS along with you. Stash a few in the car, a couple by the front door and you will be ready to put up with anything the box boy dishes out. 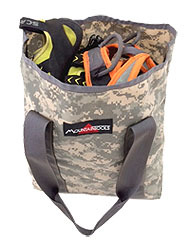 Use too for casual trips to the gym (harness and shoes on top, rope belays right out of the bag) and sport cragging. Takes up the slack for brief case overflow, extra gear, ropes, tire chains... you get the picture. 100 year guarantee! Made in California.